SAN FRANCISCO -- Back in 2010, when Google revealed that it was working on self-driving cars, the auto industry reacted with a blend of confusion and curiosity. Why would Google, an Internet search engine and advertising company, want to develop a car? Five years later, conventional automakers and suppliers understand the answer. And they are responding by racing Google to perfect computer-piloted driving. Now Apple, another Silicon Valley giant, is lining up to give the industry its next big push. Apple has assigned hundreds of people to a secret electric-car initiative code-named "Project Titan," with an initial design resembling a minivan, The Wall Street Journal reported Feb. 13, triggering the same bemusement that was once directed at Google. "None of us want to have different platforms in different parts of our lives. We want one seamless kind of life. I think that's huge for our future." Apple's CarPlay offers some phone features, but it is not a fully integrated solution. "We've taken iOS and we've extended it into your car, your home, into your health," he said, referring to the software used in the iPhone, iPad and forthcoming Apple Watch. "All of these are really critical parts of your life, and none of us want to have different platforms in different parts of our lives. We want one seamless kind of life. I think that's huge for our future." 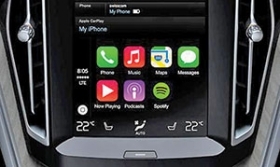 Apple's current offering for the car is CarPlay, which projects an iPhone's navigation, music and messaging apps onto a car's navigation screen. The technology is being rolled out -- slowly -- on various models beginning this year. But CarPlay merely piggybacks on a vehicle's existing infrastructure. Until Apple can tap deeply into a car's network of computers, cameras and sensors, CarPlay is a stub, a makeshift solution to the problem of driver distraction that offers no more utility -- in fact, much less -- than an iPhone. That is where Project Titan may come in. Few people know the actual parameters of the project. Some have suggested Apple wants to build a better self-driving car than Google or a better electric car than Tesla Motors. Reports last week said Apple wants to begin production of an EV as early as 2020. A lawsuit by battery maker A123 Systems alleging that Apple poached its top engineers suggests that Apple is working on acquiring advanced battery technology. Others think Apple wants to expand its electronics empire by designing an upgradeable in-car interface that wouldn't become obsolete as rapidly as the infotainment systems in most of today's cars. But the code-name of the project itself suggests that Apple's ambitions are broader than that, even if they don't include selling an Apple-branded vehicle. Of course, Apple has the resources to do just about anything, including taking a huge gamble on a potential fiasco. It is the wealthiest corporation in the world, with $178 billion in cash and a market capitalization triple that of Toyota's. It also has a knack for dethroning industry giants, Nokia and BlackBerry among them. But there's little reason to believe that Apple would want to join a marketplace that already exists -- without the opportunity to revolutionize it. "Apple would never lock themselves into three-to-five year product life cycles," said Steve Wilhite, who was vice president of global marketing for Apple from 1999 to 2000 between marketing stints at Volkswagen, Nissan and Hyundai. "Their technology and imagination are just too fertile to do that. They'd have to find the right automotive leader to partner with them and fundamentally change their development model. And I don't know who that would be." He added: "The idea of them building a complete Apple-branded car is pretty far-fetched." Lutz: Apple cars aren't likely. Bob Lutz, the former product development chief at General Motors, says the likely course for Apple is to develop a modular, upgradeable in-car operating system or work on autonomous driving technology as a long-range r&d play. An exercise like that would help refine any number of existing Apple endeavors, from image recognition to wireless communications to human-machine interface. "Apple can enter the automobile business in multiple ways," Lutz said in an interview. "Do I think they are going to work with vehicles? Yes. Do I think they intend to produce entire cars? No." So what does Apple bring to the table? Tony Posawatz, who was line director for the Chevrolet Volt and now sits on the board of the connected-car services company Inrix Inc., said Apple -- a master of integrating hardware, software and user interfaces -- could prosper by improving on today's mostly "clumsy" in-car computers. "If I were at Apple and I were serious, I'd do a learning exercise that's pretty modest, maybe a smaller-scale electric vehicle," said Posawatz, who was briefly CEO of Fisker Automotive before the EV startup filed for bankruptcy in late 2013. "You don't want to tackle all of the challenges at once." Apple has other valuable strengths, said Henrik Fisker, the veteran BMW and Aston Martin designer who was chairman of Fisker Automotive before its bankruptcy. Among them are a brand that captivates young people more than perhaps any auto brand and a design team led by Jonathan Ive, whom Fisker described as "probably the best product designer in the world." "He has a global view," Fisker said. "What he creates with his team appeals to people globally and is seen as beautiful globally. That, of course, is exactly what you need to do in the auto industry nowadays." Fisker said that if Apple built a car, one challenge would be designing an object that is true to Apple's aesthetic but still suitable for real-world use. Unlike, say, iPods, cars must look attractive in motion or standing still and in all sorts of weather and lighting. "If you can get people who aren't interested in cars to actually turn around and look at a car, you're really successful," Fisker said. That sums up Apple's challenge and opportunity. To create the seamless iOS experience Cook called for, it's not enough for Apple to be present in the car. It must know cars well enough to build one from scratch. That means integrating hardware, software, mechanical components and the user interface into an Apple-conceived whole. To understand the distinction, turn the clock back to the 2005 debut of the Motorola ROKR E1, the first cellphone with Apple's iTunes music program built into it. Motorola was the establishment in cellphones and mobile audio. But the phone was a study in compromises, with neither the elegance of Apple's iPod interfaces nor the sleekness of Motorola's popular RAZR phones. Its capacity was a paltry 100 songs. 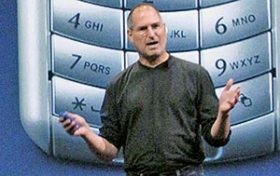 Apple's then-CEO Steve Jobs dubbed it the "iTunes Phone" and damned it with faint praise. Before long, Apple was in the cellphone business on its own. 2005's Motorola ROKR E1, dubbed the "iTunes Phone" by Steve Jobs, gave way to Apple's own iPhone. The iPhone has been the foundation of Apple's profits and prestige ever since. Perhaps more significant than its robust sales was the platform it created for thousands of other companies to innovate and prosper. This is the potential payoff of an Apple concept vehicle. For Google, building a prototype car has not only been a way to figure out how all the pieces fit together but also helped Google crystallize its vision of a crash-free transportation system. 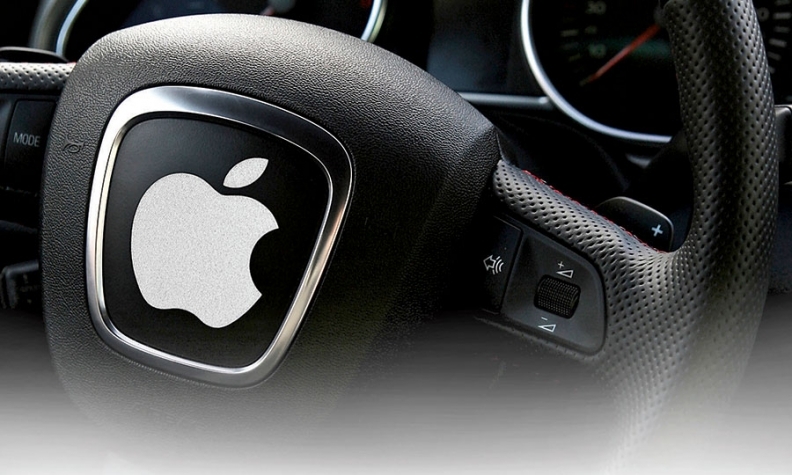 Apple similarly has much to learn about automobiles before it can hope to revolutionize them. But if it succeeds, Apple also has a chance to claim a new frontier and extend its vision for a "seamless kind of life" to every facet of the automobile. And considering how well Apple has harnessed the supply chain to revolutionize the smartphone, Lutz said, "they could wind up doing a spectacularly good job."